In just two weeks Operation Potcat will start. 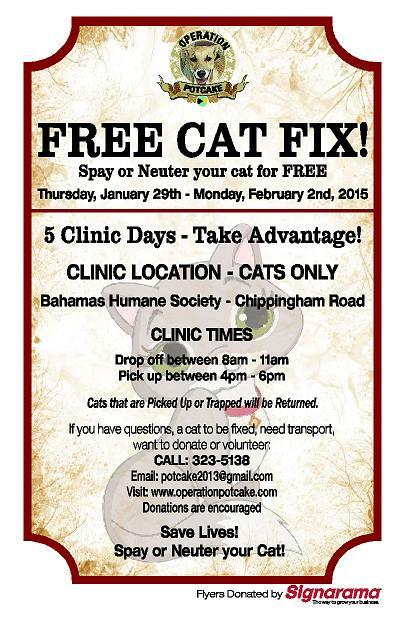 We will be spaying and neutering cats in New Providence, Bahamas. The clinic dates are from Thursday January 29th to Monday February 2nd 2015, see the flyer below for times and location. If you are aware of any cat colonies in this area please let us know. Please also spread the word so as many low income families as possible can make use of this opportunity to have their cats sterilized at no cost to them. We’re also still looking for local volunteers to help trap, transport and assist with general duties in the clinic. If you have any spare hours or days available please let us know.